Dr. Miguel Bañuls is a British Trained Spinal Orthopaedic Surgeon, offering treatment for Bones, Joints and Spinal Diseases. We aim to provide the best possible treatment for every patient according to his/her personal needs. Dr. Miguel Bañuls is a British trained Spinal Orthopaedic Surgeon based on the Costa Blanca, Spain. He works from his private clinic in Denia. He also attends a private clinic in Javea (Euro Clínica Javea). Dr Banuls offers a compliment of services. Diagnostic service for complex spinal complaints. Treatment of chronic back pain, both surgical and non surgical. The latest minimal invasive (keyhole) spinal surgery techniques. It is Dr Bañuls aim, using surgical and non surgical techniques, to restore function and improve the quality of life of his patients. With Dr Banuls there is no need for an interpreter.He is totally fluent in English. You can converse with your specialist confident that he will understand you and more importantly that you will understand him. 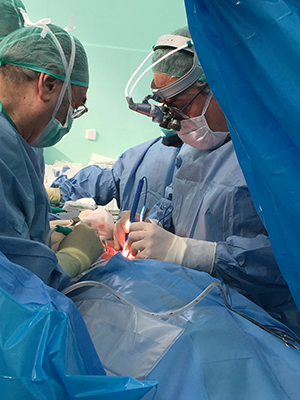 Dr. Bañuls after completing his training in the UK returned to Spain in 2001, when he began practising as a private Spinal Orthopaedic Surgeon on the Costa Blanca. Any information submitted to us will be subject to strict patient confidentiality rules. Any information provided to medical practitioners is covered under the Data Protection Act. Your written consent must be provided for access to your medical records by any third party, eg insurance company, as we are unable to disclose any information without your consent.